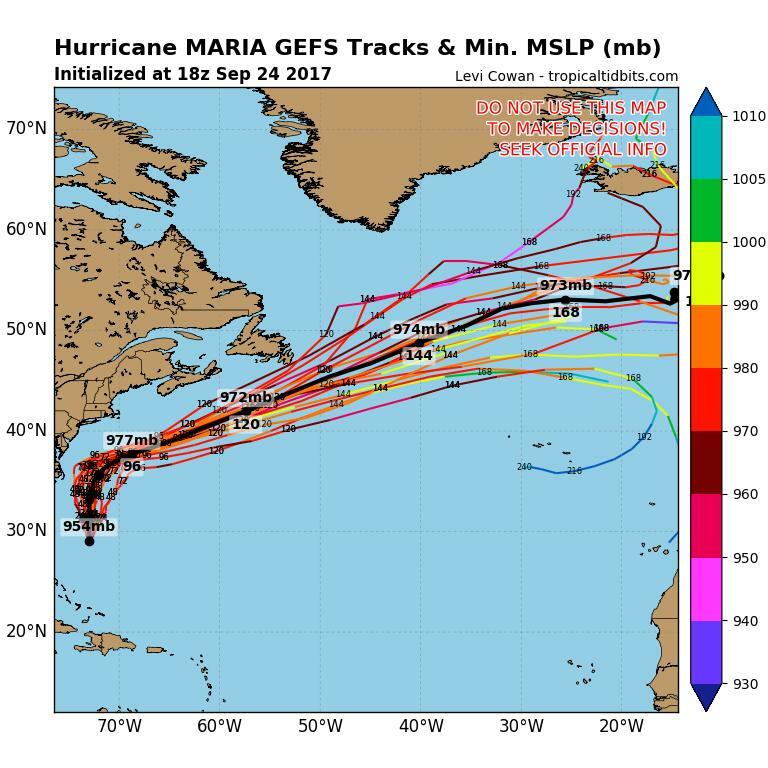 Irma - Oh no, right over Marathon! The front that came thorugh was mostly wind, just a little rain. There's still a few of us here. 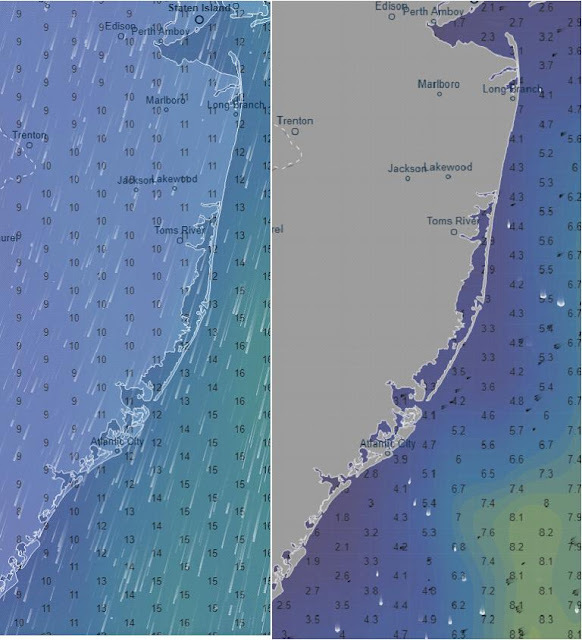 We went to bed with visions of sailing down the New Jersey coast in 5 to 10 kt winds out of the north and 2 ft or less waves. You can imagine my surprise when I looked at the forecast when I got up at 4:30. 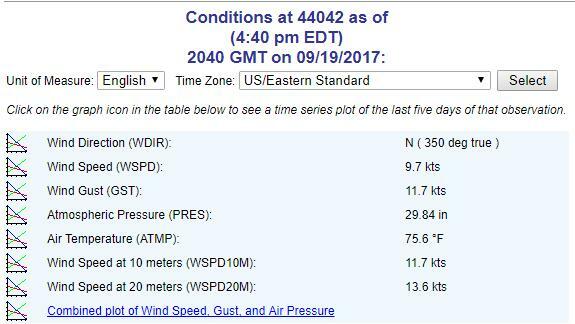 It had changed to 10 tod 15 with gusts to 25 and later on up to 30 kts with a small craft advisory issued for the afternoon. It looked like we might be able to beat the storm by leaving around 6:00 am and staying ahead of the worst of the winds. However, there's just the two of us and we simply did not want to risk the chance that the storm would suddenly speed up and catch us without any alternative but to soldier on to Atlantic City. 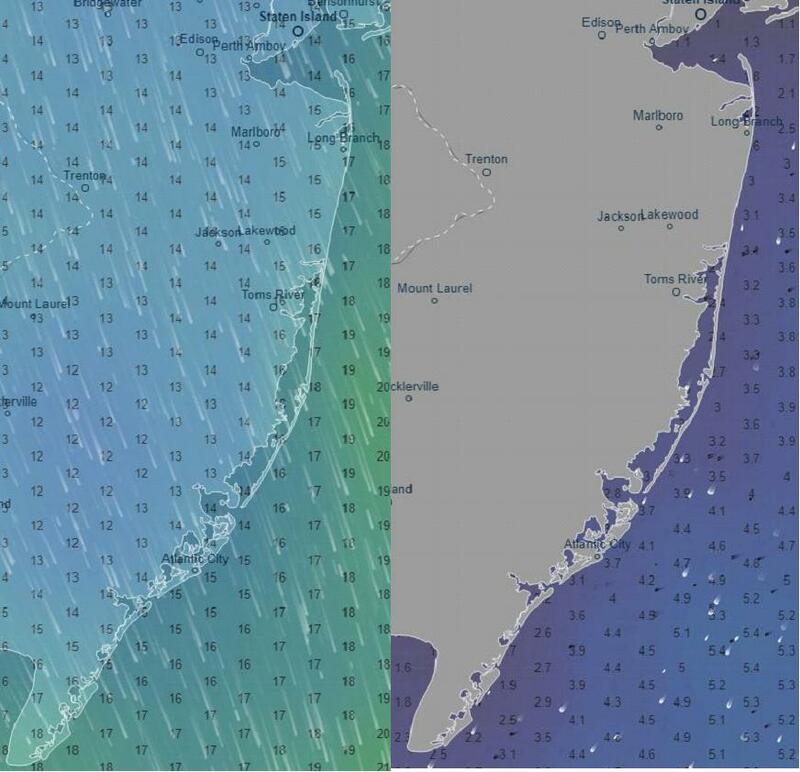 There are no inbetween harbor for us between Sandy Hook and Atlantic City. So with great regrets, we decided to stay at anchor in Atlantic Highlands and wait for better weather for the trip south. As promised, the storm came and we're riding it out at anchor with 20 kts winds with gusts to 25. 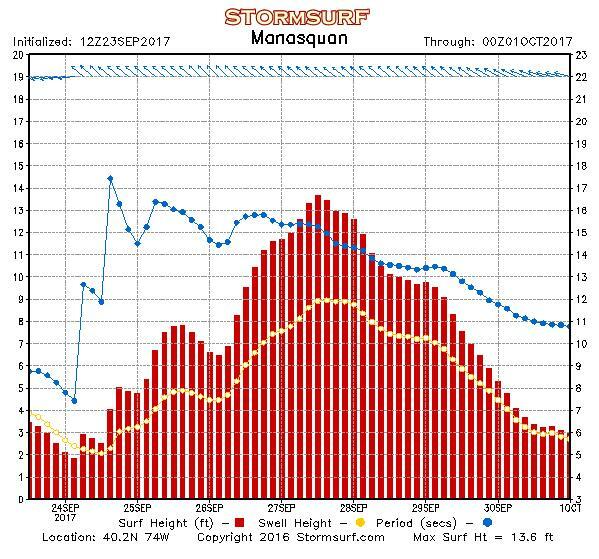 At least we are mostly behind the breakwater given the wind direction so far and it's supposed to slack off after midnight. It's exciting taking Hoolie to shore in such conditions. We are using up our slack days like mad. Once we reach Chesapeake City, it will be a whirlwind trip south if the weather permits. 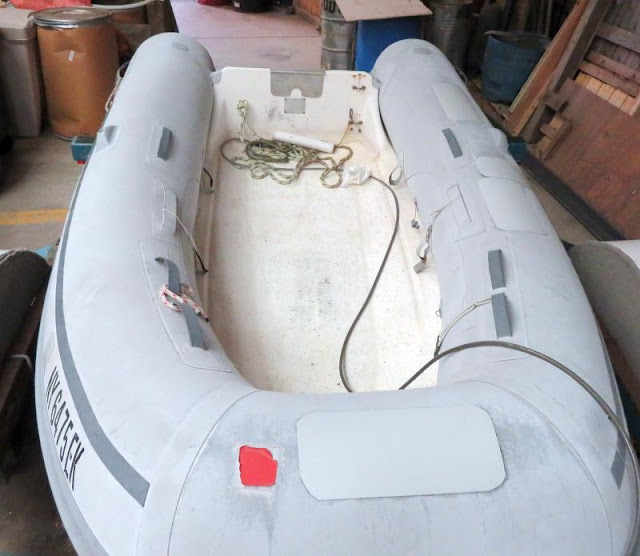 We will get as far south as we can before leaving the boat somewhere and renting a car for the trip back north for the holidays. We do not want to miss Thanksgiving and Christmas with the kids and grandkids. 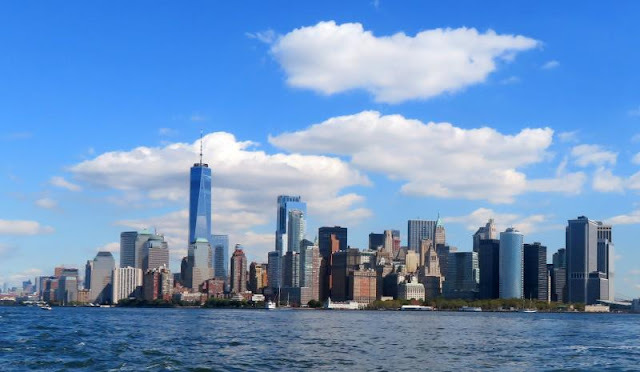 Just by pure dumb luck, the trip down the Hudson River could not have been better. We left Haverstraw Cove and caught the outgoing tide which we rode all the way to the Verrazano Bridge. 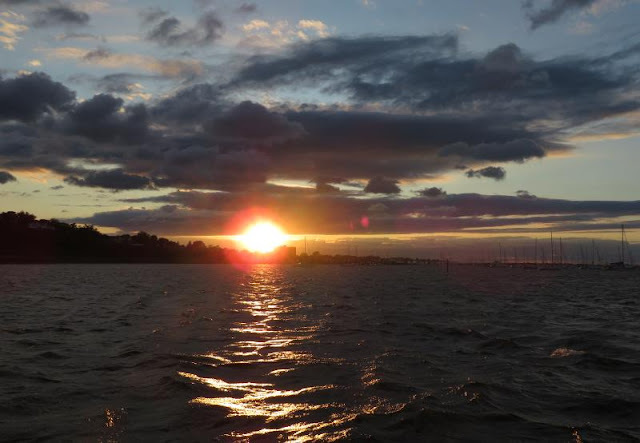 We had a short distance where the tide was against us but as we came abreast of Sandy Point, we had the tide with us the rest of the way to Atlantic Highlands. 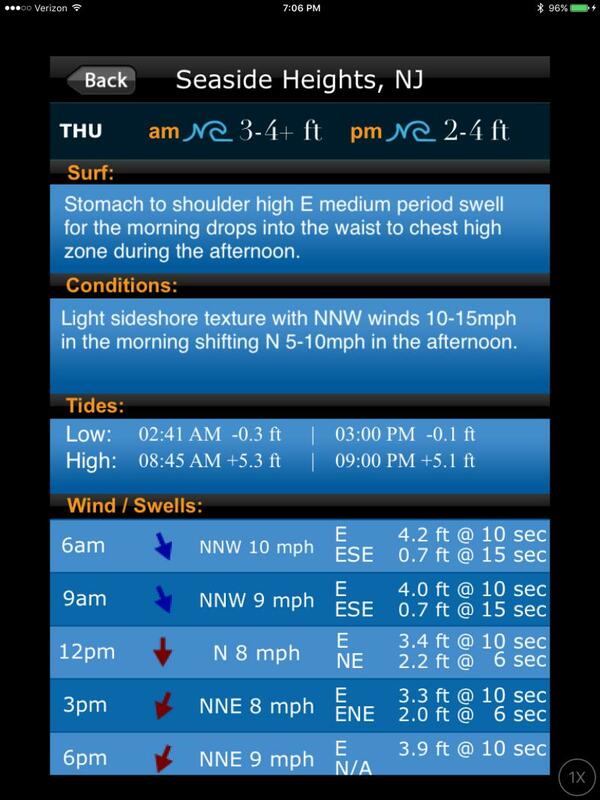 Add to that trip the north wind at our backs and no wave action at all with full sun all day. Maybe the weather is trying to make amends for all the bad weather up until now. We dropped the hook at 2:00 pm and there was already 13 boats anchored. It was predicted to be a calm night so it really didn't matter where you anchored; there's lots of room just be going farther east. 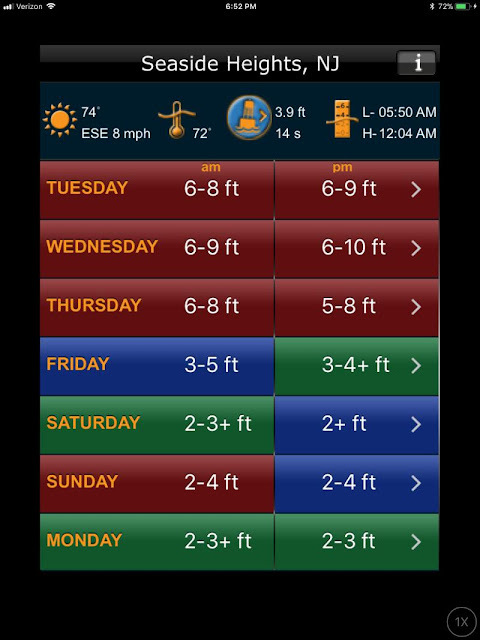 Saturday is rumored to be a good day with winds out of the north and waves less than 3 ft. They are pretty good a predicting the weather three hours in advance so we'll check in the morning but I'm pretty sure we're going. There will be a regular armada headed south! 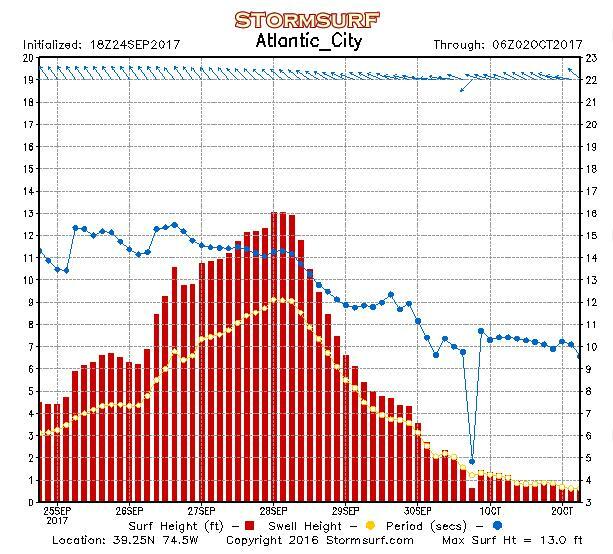 Once in Atlantic City, our next stop will be Cape May but perhaps not on Sunday due to a front coming through. We'll see how it goes. It was windy but a beautiful day. The entrance to the cove is straight ahead. Favor the south shore. We left PYC in a strong, north wind. As we headed south on the Hudson River, we recorded gusts to 32 kts! However, the magic is in going in the direction of the wind. It blew but the waves and current were with us and we made excellent time. 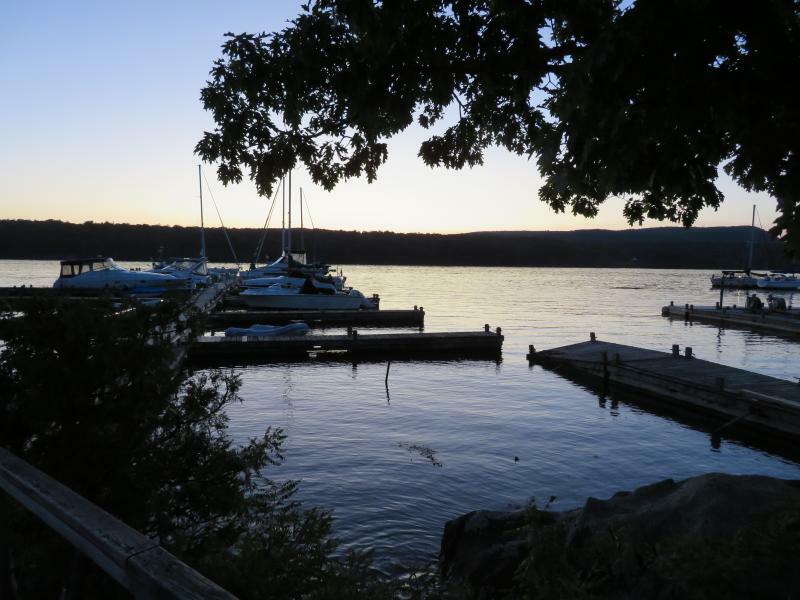 The north side of Croton Point was not an option and the south side is too shallow for us. 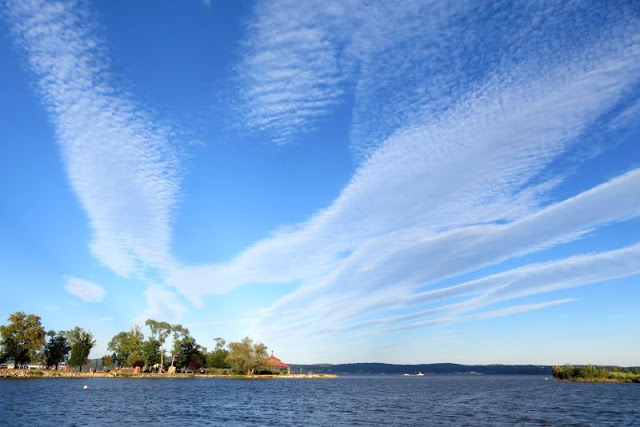 We ducked into Haverstraw Cove. It offers 360 protected but it's uncharted on the map. I've been into it a dozen times and drew up a chart just for that area with waypoints on how to safely enter since there's a brick wall on the north side of the entrance under the water. Nevertheless, you can safely enter by following this chart. There is also a GPX route available here. Once you are inside, it can howl all it wants outside but you'll spend a peaceful night. It doesn't matter what direction the wind blows, it will be calm in the cove. 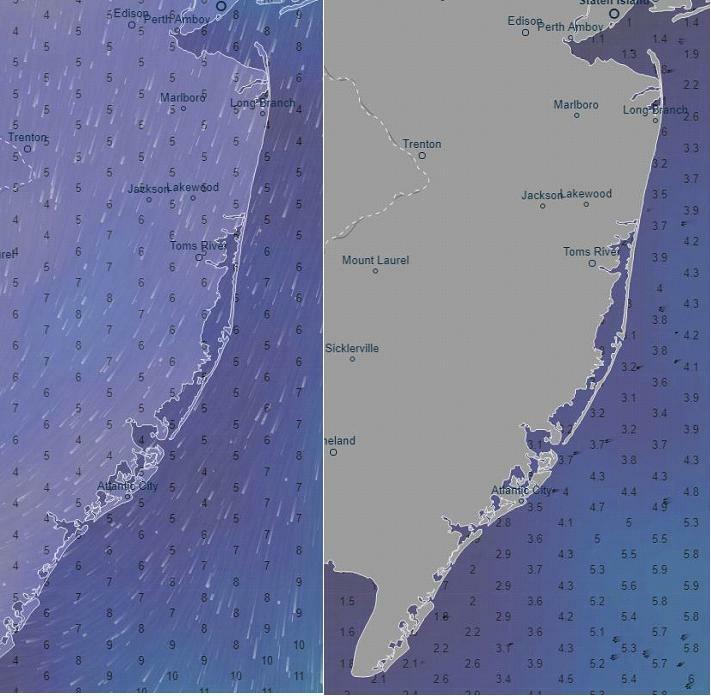 We'll leave early Friday morning for the trip south to Atlantic Highlands. The forecast is still good for a trip down the New Jersey coast on Saturday to Atlantic City. From there we will see what the weather brings. On Fleetwing - we ready to move Thursday! Finally! Let's see, Hoolie hangs out on the port side of the dinghy, guess where the patches are located? We loaded Fleetwing this afternoon and we're ready to go on Thursday morning. The hurricanes have finally departed. 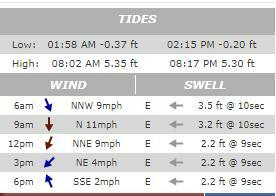 The forecasts for Saturday have been wildly varying. Some days it's good, some days it's bad. Currently it's for 15 kts or a little higher out of the north with a 3ft swell. It's not ideal but it's good enough for us to get down the coast to Atlantic City. We met two boats on the way south from Toronto and they are also looking to anchor out at Atlantic City Friday night. I suspect there will be a crowd there for the leg south. 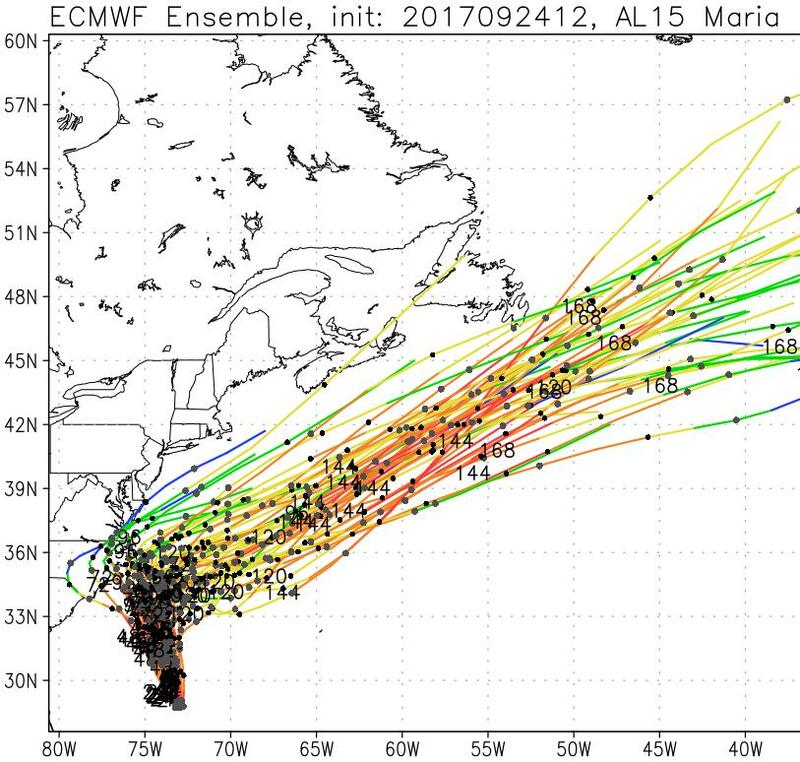 With all the hurricanes, everyone's looking at the first window for the rush down the coast. With all the delays, we are not so early this year. Evening at PYC. We're anxious to get off Thursday morning! Meanwhile, Hoolie is going fine. He's happy to be back on Fleetwing. It's his real home since he's spent more time on Fleetwing than on land in his lifetime. We heard from Dennis, a friend from Key West a few dock slips down from us in Key West Bight Marina. His boat has a few scratches but it's fine. The Bight itself didn't sustain any damage since the seawall was not breached. All they had was wind but not the damaging waves. We're headed south! The various models still do not agree on Saturday. In a change of form, the NOAA Coastal Forecast is actually more conservative than the grib forecast for Saturday. 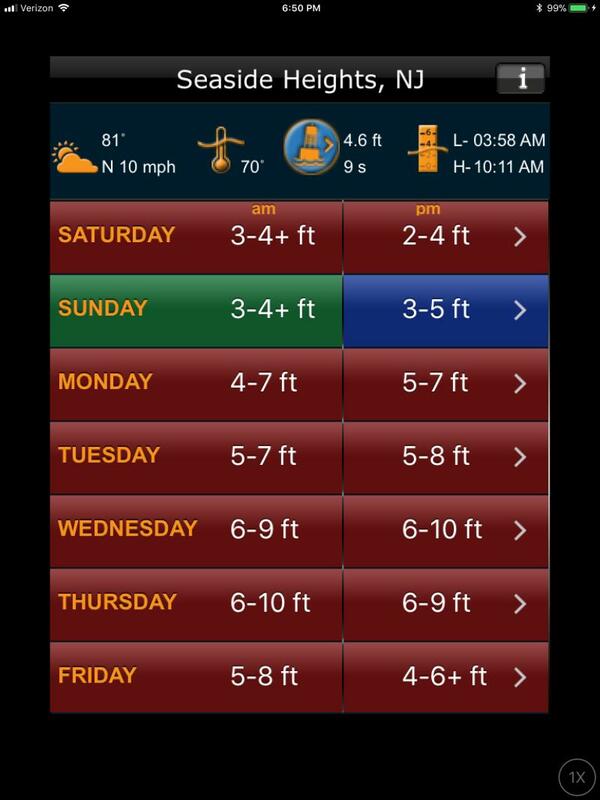 At any rate, we're headed down the coast on the weekend; Saturday or Sunday. So who to believe? Hopefully, as we close in on Saturday, things will become clearer. 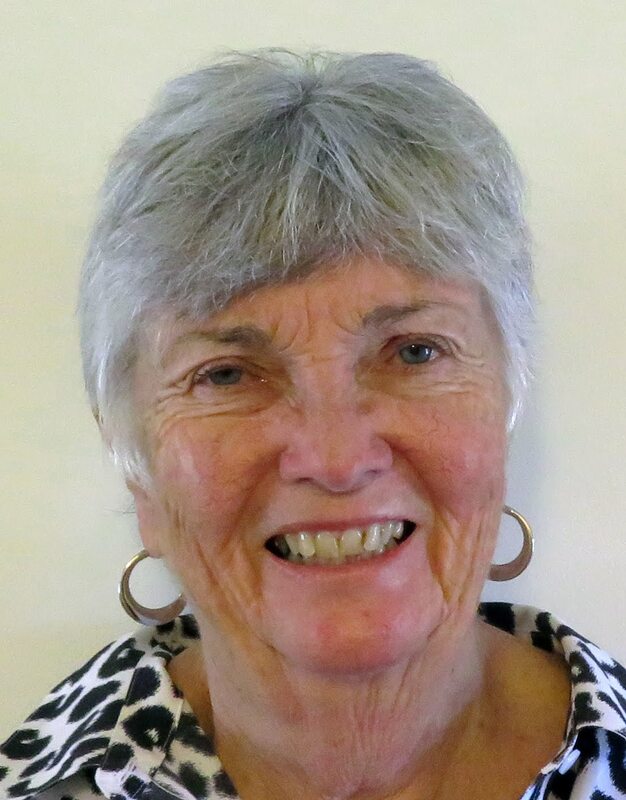 Ann will do her last provisioning Wednesday morning and we'll board Fleetwing in the afternoon. The last time we were about to do this, we called the trip off on the morning we were due to board but that was three weeks ago! That's not going to happen this time. 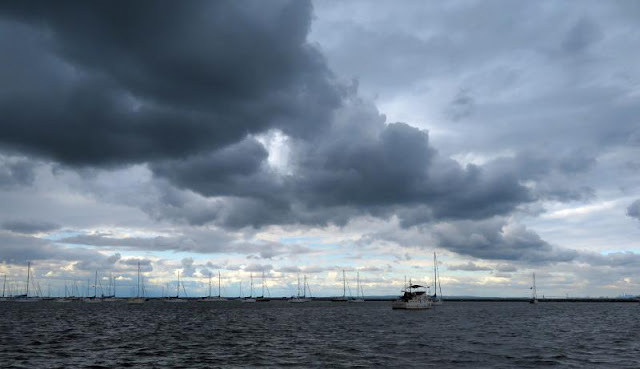 If the forecast turns worse, we'll just wait it out at Atlantic Highlands. There might be a crowd there! Is there any wonder that Irland gets more rain than a Brazilian rainforest? 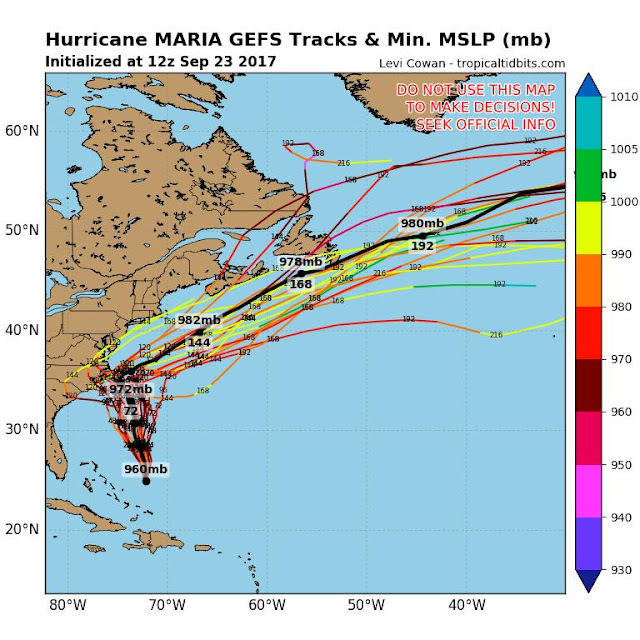 According to all the projections, Maria is going to make a right angle turn to the east and clear the way for us to move south, finally! The forecasts for the weekend have been all over the place. It seems to vary every three hours, with every update. First, Saturday is good, Sunday is bad, then Saturday is bad but Sunday is good and so on. 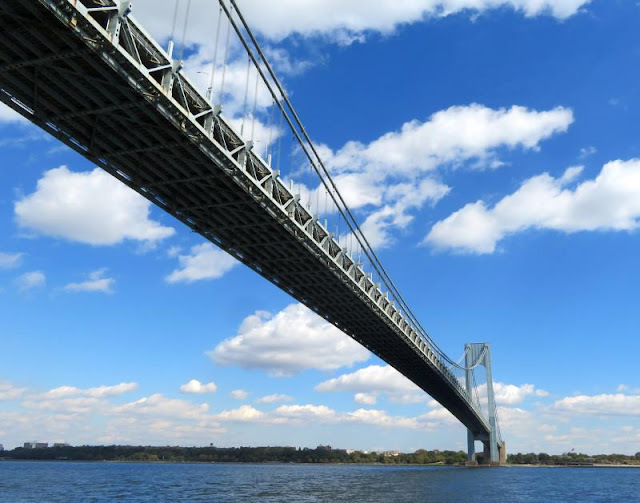 Regardless, we are heading out of the Poughkeepsie YC on Thursday so we can stage at Atlantic Highlands for the trip down the New Jersey coast on Saturday or Sunday. Our ideal route would be to overnight at Atlantic City and then round the Cape the next day and anchor out at Cohansey Island in preparation for the trip to Chesapeake City the next day (there's a flood tide to help out). That would get us off the Atlantic and decrease the nervous factor. 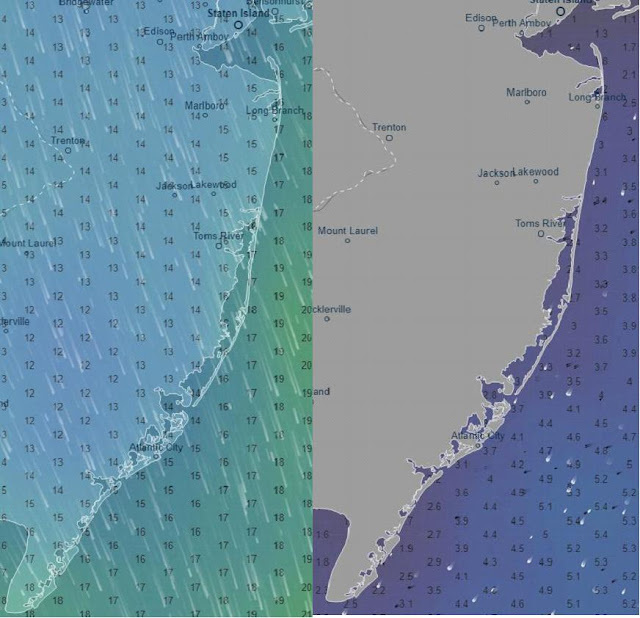 We've been through enough of these events to know that the weather can change dramatically overnight so we want to be at the launch point (Atlantic Highlands) for the inevitable change in the forecast. I imagine there might be more than a few boats down there thinking the same thing! If so, we'll hold a Happy Hour in the cockpit of our boat at 5:00 pm on Friday evening. Come one, come all. 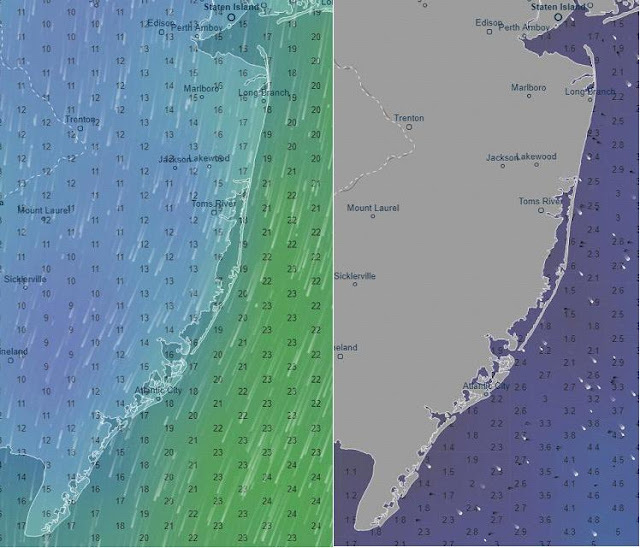 The US and Euro models do not agree on the amount of wind for Saturday or Sunday. The Euro shows less wind but yesterday the Euro model showed more wind. The forecast for the weekend is still uncertain but one of the two days ought to be good enough. 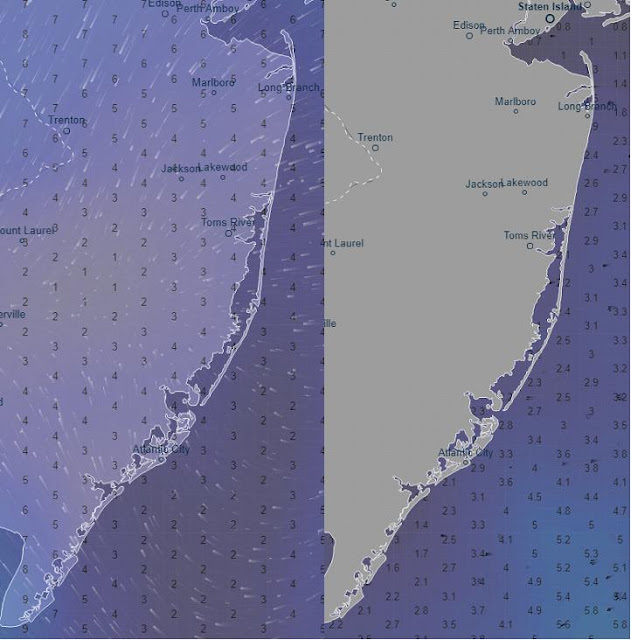 The winds remain with a northerly component. We will be at the Atlantic Highlands anchorage Friday night to be ready for a Saturday run down the coast if the forecast doesn't get any worse. 9/6/2017 survey of Shallotte - shoaling once again! 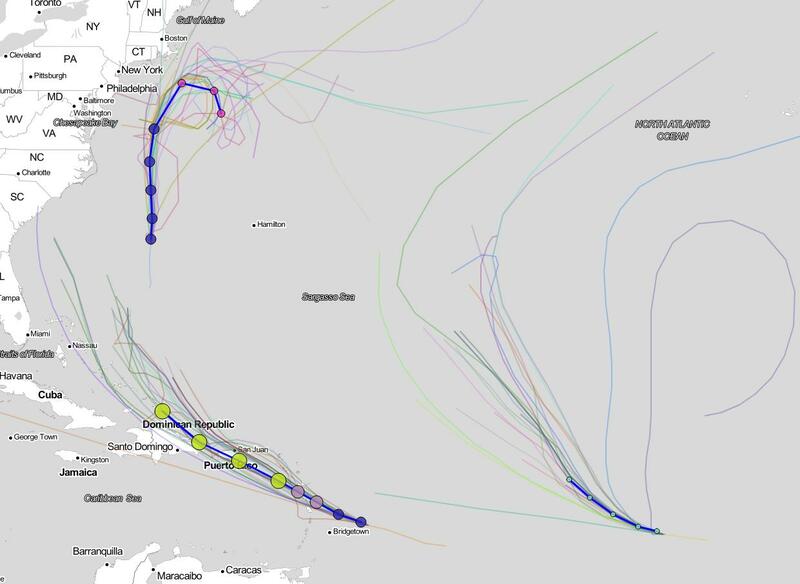 Meanwhile, the inlets down south keep shoaling in. The newest victim is Shallotte Inlet. It was just dredged in the spring but it's shoaling in again. The Army Corps of Engineers (ACOE) provided a new set of waypoints to avoid the shoaling and I included them in the GPX Routes page under BShallotte Inlet. You can see the latest surveys and a list of waypoints at ACOE Surveys of Inlets. We need to get down south in a hurry before more inlets shoal even more. A kiss to North Carolina - then bye, bye? Maria is testing us. She keeps moving farther to the west with every update, just to keep us on our toes. When is this ever going to stop! In reading all the reports, it appears that the conditions are very favorable for yet another storm developing in the Caribbean in the next two weeks (warm waters, no shear). I want to get down the coast before that happens. Even though the Maria forecasts keep pushing her to the west for a touch and go with North Carolina, she is still predicted to quickly leave the area after that kiss (both the US and Euro models at least agree on that much). 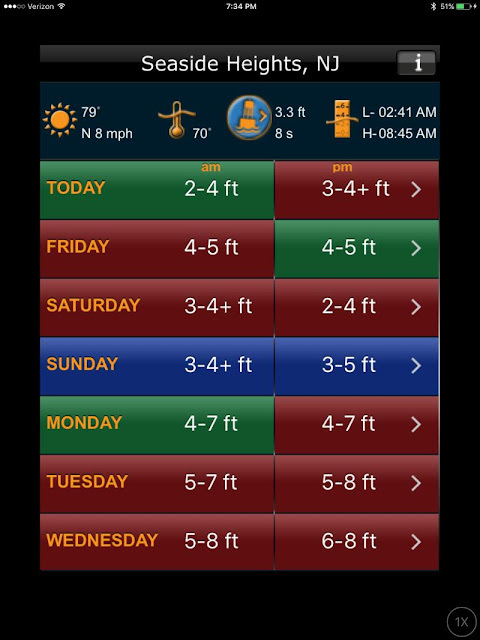 So with all that, Saturday is looking like the first possible day for us going down the New Jersey coast with swells in the 2-4 ft range. Still a little high and the winds are a little too strong at 17 kts but at least out of the north. That may be doable for us, we'll wait and see. 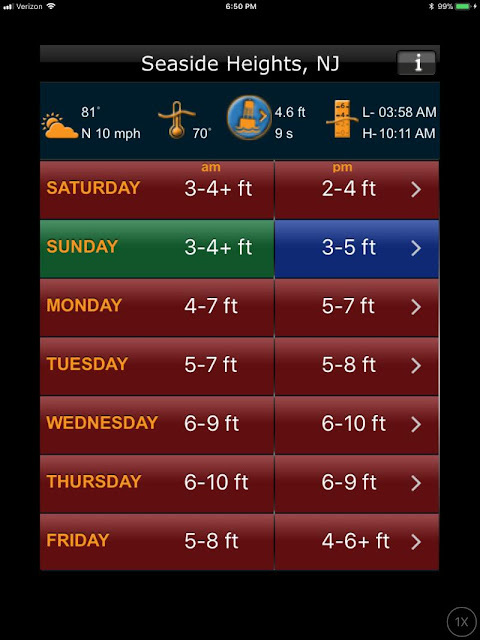 Sunday may be better to give the seas more of a chance to calm down. However, we don't want to wait long enough for yet another storm to develop and head north! The waves are just too big for our liking. It may be okay for some but not for us, we like calmer conditions. Jose is slowly dying with the emphasis on "slowly." Nevertheless, he's still stirring up the Atlantic and coastal New Jersey. The only good conditions slightly visible on the horizon is for 9/30 and 10/1. The only problem is that it's always mañana. When the anticipated day arrives, there's always another problem. 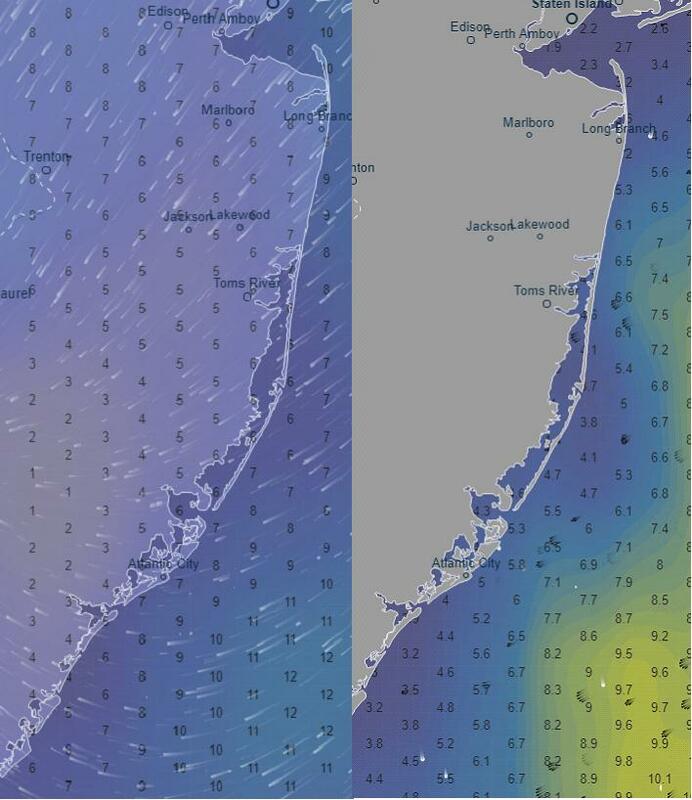 If the promised day arrives in view, we'll leave PYC on Friday to make the run down the coast on 10/1, Sunday. It is still far too early to make such plans but we can hope. 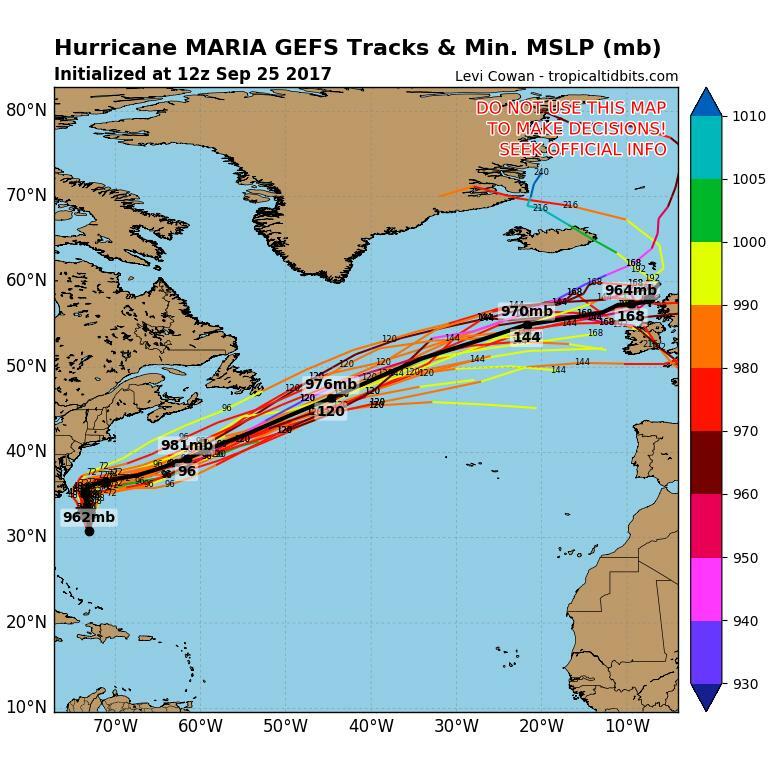 The forecasted track for Maria keeps inching westward with every update! Every forecast keeps moving it just a little in the wrong direction. 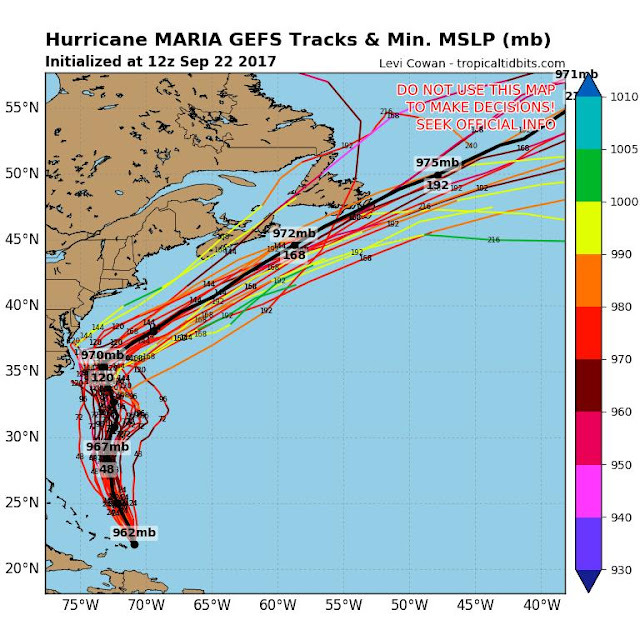 They all still have Maria rushing out to sea when reaching east of the coast of North Carolina but we would all feel better if it stayed farther away. We continue on pins and needles! 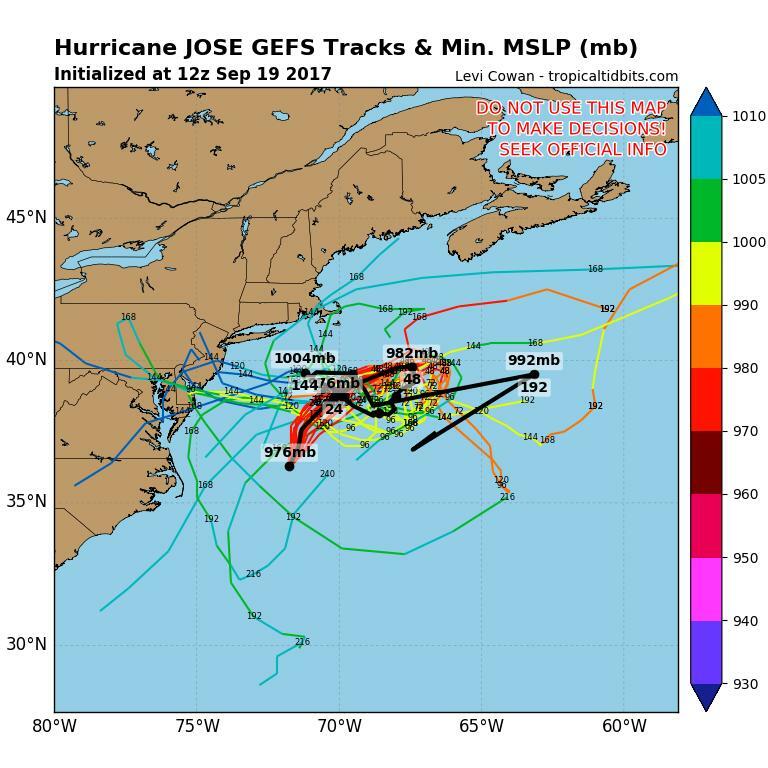 It looks like Jose will gradually fade away but in the meantime, it will continue to stir up the seas. 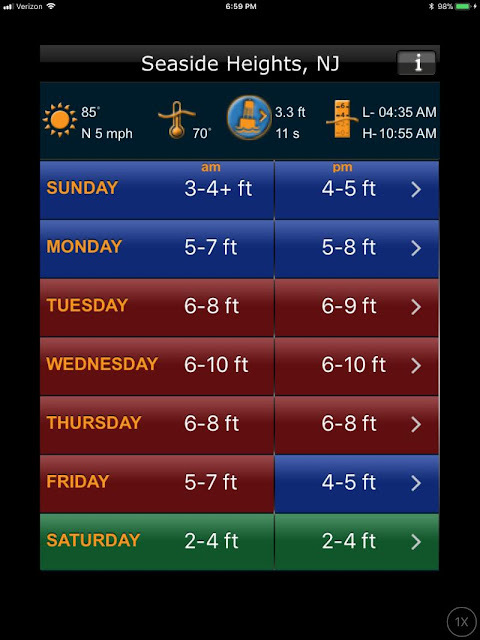 A trip down the coast looks doable as far as wind is concerned from Friday Monday but you have to contend with large swells in the 4 to 7 ft range, depending on the day. On the other hand, the swells have a period of at least 10 sec and up to 14 seconds. At that rate, it's up and down but not breaking. For us up here in Poughkeepsie YC, it's still too much and we'll sit the weather out until Maria passes by on Thursday. After that, it's the normal October weather to contend with. 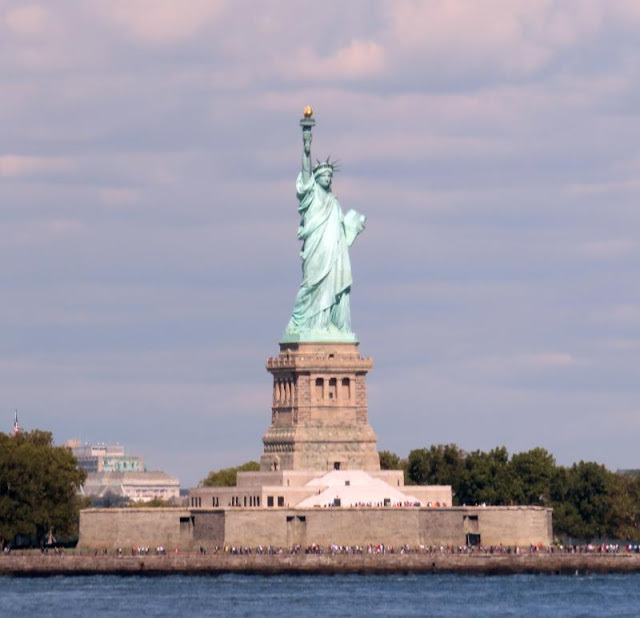 We are tentatively aiming for a trip down the New Jersey coast on Saturday, 9/30. By that time the seas should have subsided and the winds normal for that time of the year out of the north. This has been a terrible year for waiting! Jose, US model - To The Coast! Want to try passing through that path? 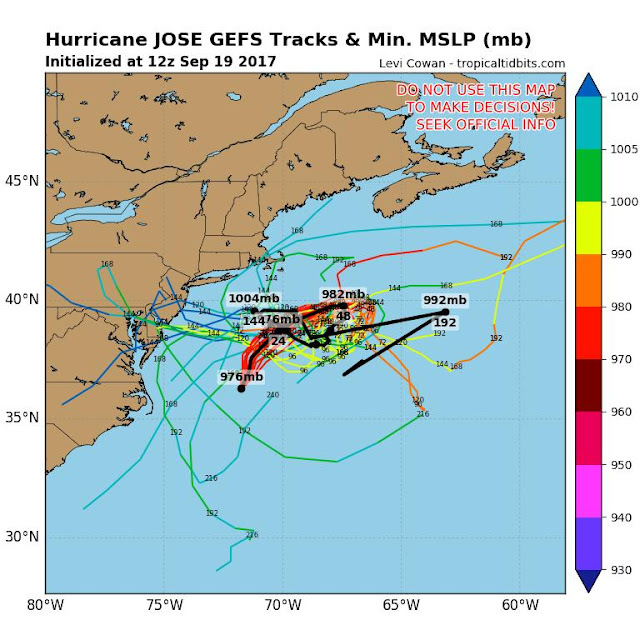 through Jose to get there unless you hugged the coast. Wind on the left, waves on the right. So Jose is not satisfied in blocking all southern traffic, it's now going to continue doing that for the next few days and just for good measure, coast over to New Jersey to pay a visit there too! 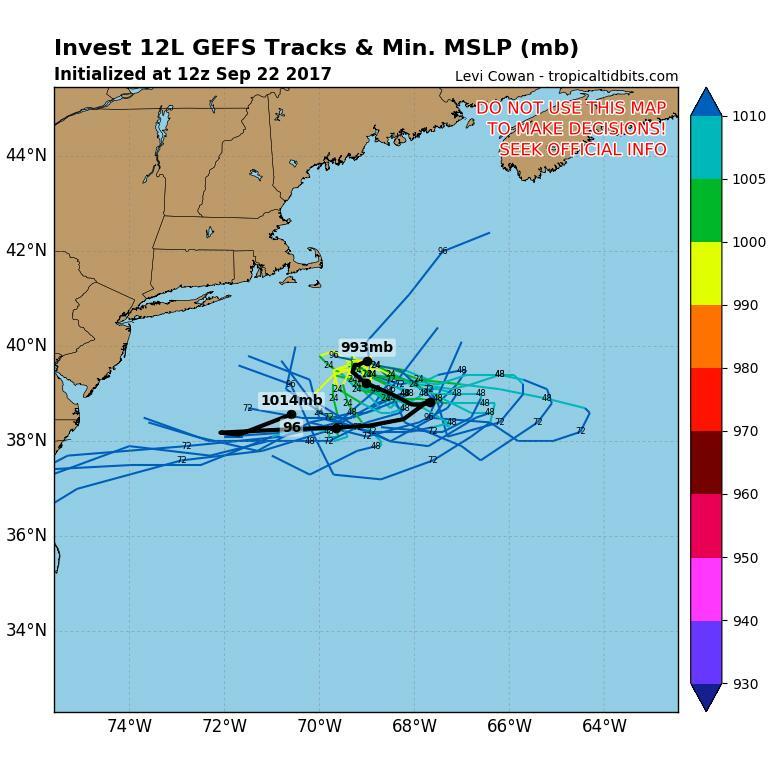 If you want to go south now, it's going to be through tropical storm weather. We are staying put until everything clears out, hopefully, that will be before Oct 4th, our new no-fly date. 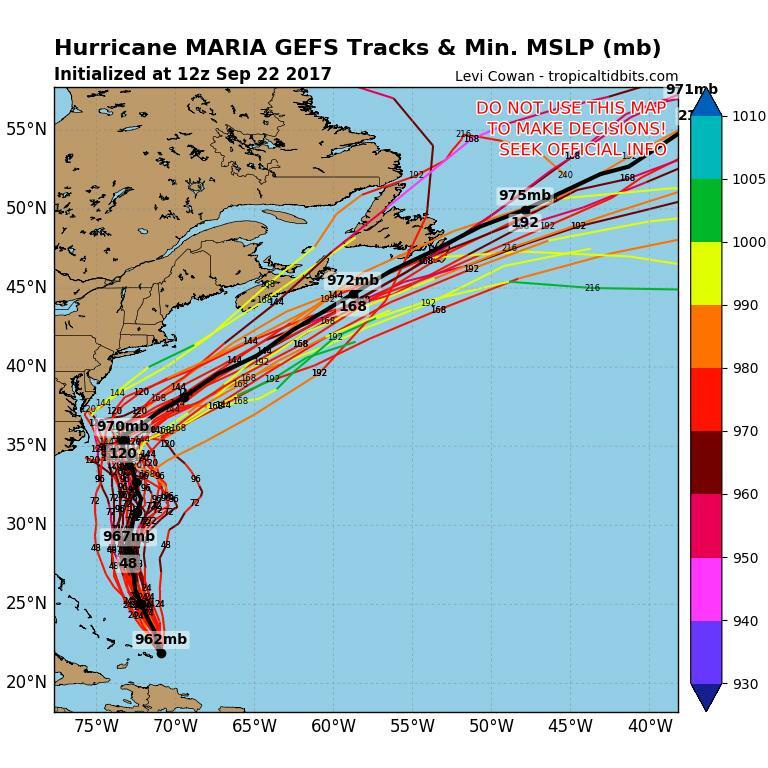 The guidance for Maria is that it will rapidly move up the coast, not make landfall, and then go out to sea without lingering like Jose. At least that's the fantasy of the moment. We'll see what reality has to say about that. It is really hard to concentrate on doing anything with Jose and Maria hanging over us. I'm sure there are a lot of cruisers in the same boat as us but it's still frustrating! Meanwhile, I'm working with AquaMap on enhancements to their app for better use in the US. I'm in almost daily contact with their development staff in Italy to add features of value to the cruisers of the ICW. They use NOAA ENC charts which is a big plus along with Active Captain markers so it's a good start. They also have unlimited routes that can be imported via the iPad interface to Google Drive. For good measure, their charts throw in the surrounding roads maps as well as topo charts as part of their bundle. One feature I've always taken for granted that I now find is far from standard is the display of an ETA for each waypoint in a route. I thought that was standard since my ancient Garmin 492 chartplotter does just that. It's invaluable in seeing when you'll arrive at a bridge in time for an opening. As you know, the ICW wanders a bit so a direct waypoint to the bridge will not work. One must put in a route with all the turns and then highlight the one waypoint at a bridge where you need it to open. Having an ETA for that bridge waypoint helps in adjusting your time to arrive just when it's ready to open and not having the do donuts in a narrow channel while waiting. The Garmin 492 has this capability but Garmin told me that none of their present chartplotters do. I got the same reply when I queried several iPad app programmers. What an oversight! AquaMap will install this capability in their next release plus a few other changes I requested. I'll keep the blog updated with their progress. It's something to do while waiting for a window. It looks like we're not moving until nearly the first of October. Our no-fly date is 10/1, after that we'll hang it up for the season if there's no opening south. We are hopeful that the hurricanes will pass by without yet another one to take their place. Thurday still looks like a small opening for a fast boat but not for Fleetwing. 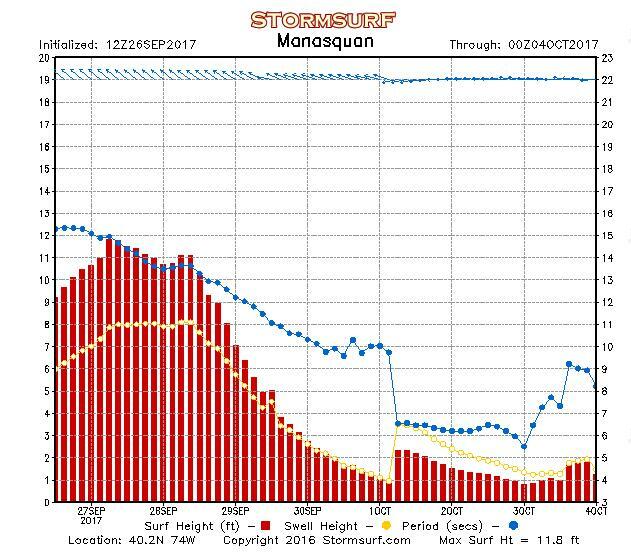 You would really want to get all the way down the coast and up the Delaware Bay to be safe. We're passing by that opportunity. Meanwhile, there are other things to get ready. I've been working on useful internet links while going south. When traveling down the ICW, it's handy to have internet links to certain, key information. 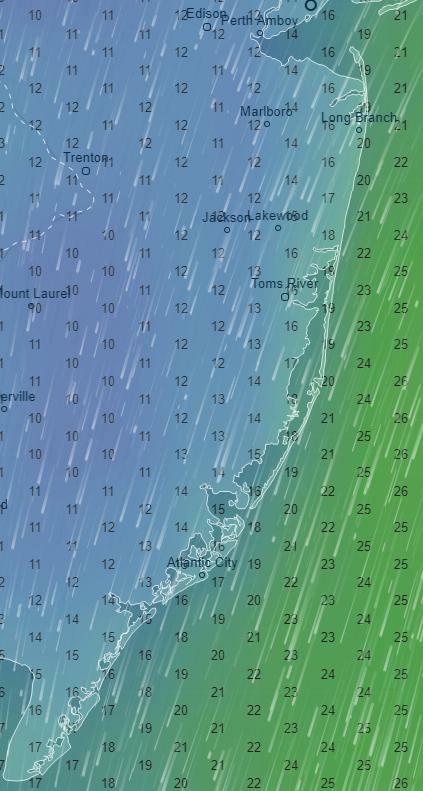 For example, You're in a secure harbor and the wind is mild at 5 to 10 kts but the forecast out in the Chesapeake is for 20 to 30 kt winds! You may think that the weatherman was being overly cautious and venture out anyway. However, the closer you get to the Chesapeake from your anchorage (several miles back), you notice the wind starting to pick up. Preparing to make the turn to head down the bay, you clock the wind at 25 kts and the waves at 3 to 4 ft! This was what the weatherman predicted but not what was expected based on conditions in an anchorage 5 miles back. This exact scenario happened to Ann and me one year while waiting for a break in the weather. Furthermore, we weren't the only ones. At least five other boats did the exact same thing and returned to the anchorage to await a better day. 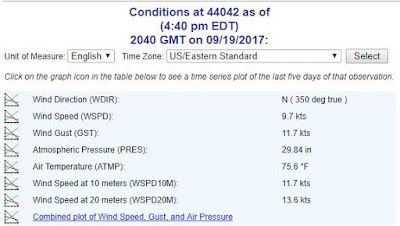 We should have accessed a weather buoy out in the bay and found the true wind speed but it wasn't convenient and we didn't think we had to at the time. Since then I compiled a list of weather buoys all along the route we take from New York to Key West and have them as Bookmarks in Google Chrome for quick and easy access. 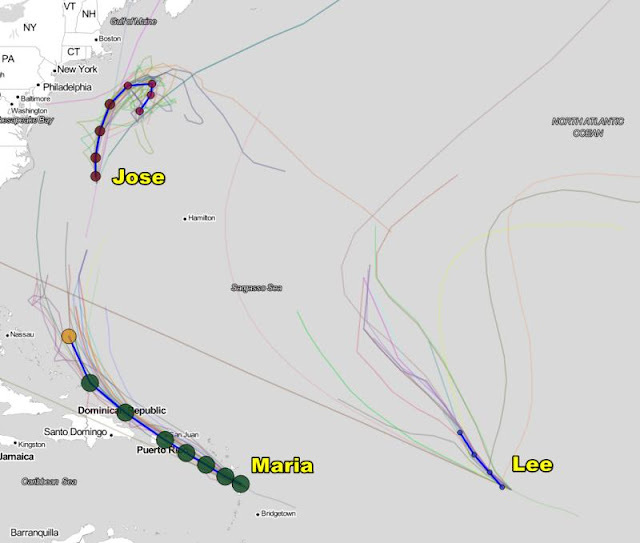 This afternoon, I also listed them as active links in the tips section of this blog at left, "Links: Weather, Surveys, Buoys, Tides." They are listed in order from north to south so you can find the one you want quickly. Having the list handy has saved me a few headaches over the years. Another useful series of links are also given for tide stations that show actual water depth vs predicted water depth. Knowledge of that delta is absolutely essential for getting under the 55 ft (at high tide, supposedly) in the Cape May canal. It's also useful to know when you're navigating a shallow passage. 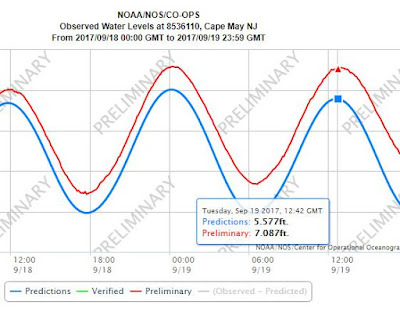 Just look at the nearest actual vs predicted tide station and you can get a feel for how much more or less water you can expect. 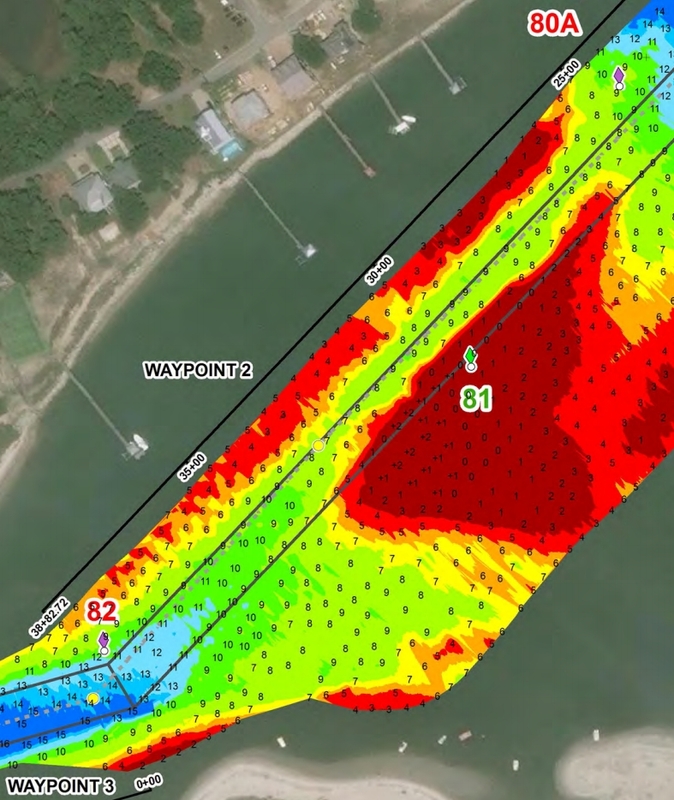 The Army Corps of Engineers (ACOE) publishes depth surveys of the ICW from Norfolk to Port Royal in South Carolina. Perhaps, someday they will extend the surveys farther south. They cover some extremely interesting stretches of the ICW that tend to shoal year after year. All of the surveys are publicly available but finding the ones of interest is not always easy. I put a list together of all the areas that show shoaling and also the inlets that tend to shoal (but perhaps not yet but you know they will) and gave those links too. There are tons of surveys and they are not easy to plow through to find ones of interest but I've already done that and you'll see a subset of just those showing shoaling now plus the inlets, all with direct links. Clicking down into a nest of links is not required. It may be very helpful to look at the links that you may pass through on a given day to see if there are any updates. It could save your bacon! 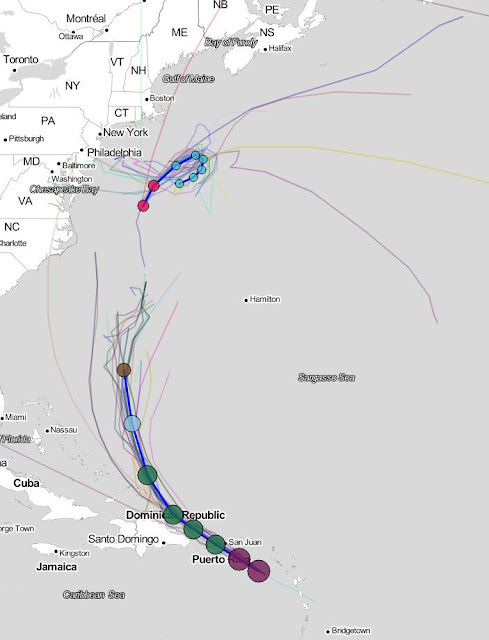 I've also included the key weather sites I access multiple times a day for hurricane information and for when I'm making a passage outside or down the Chesapeake. At least it's the ones I've found useful. 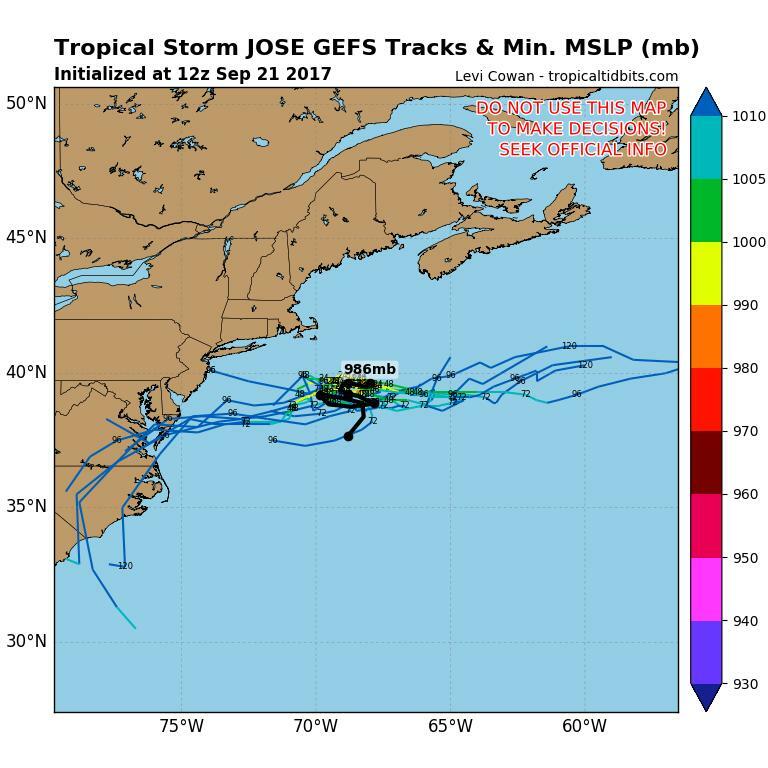 This morning, Jose was returning to the New Jersey coast! This morning the forecasts turned much direr. 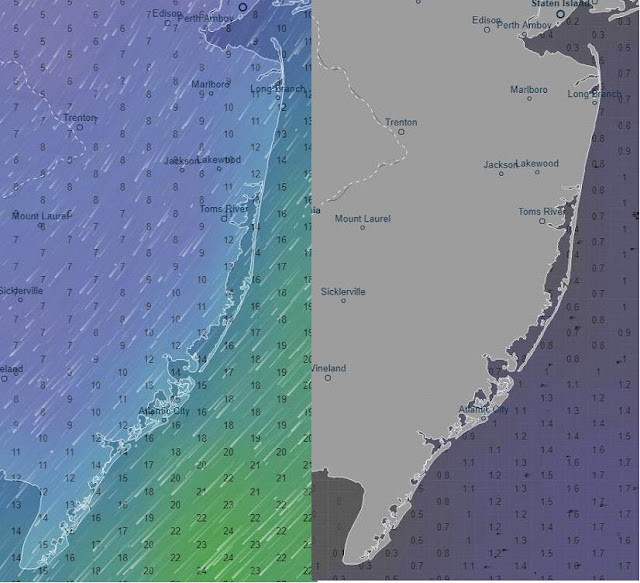 The winds were up along the coast on Thursday and even getting down the Hudson River would have been problematic with 30 kts winds against the tide. 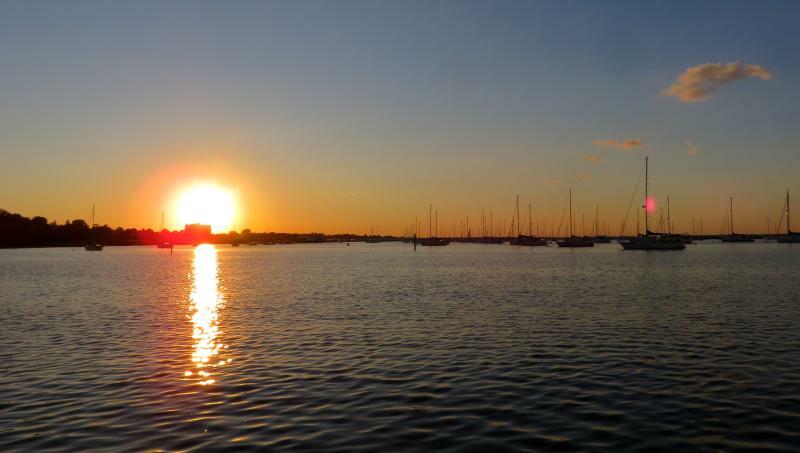 With all that input, we decided to cancel our 9/19 departure date from PYC. Then, of course, everything changed once again. 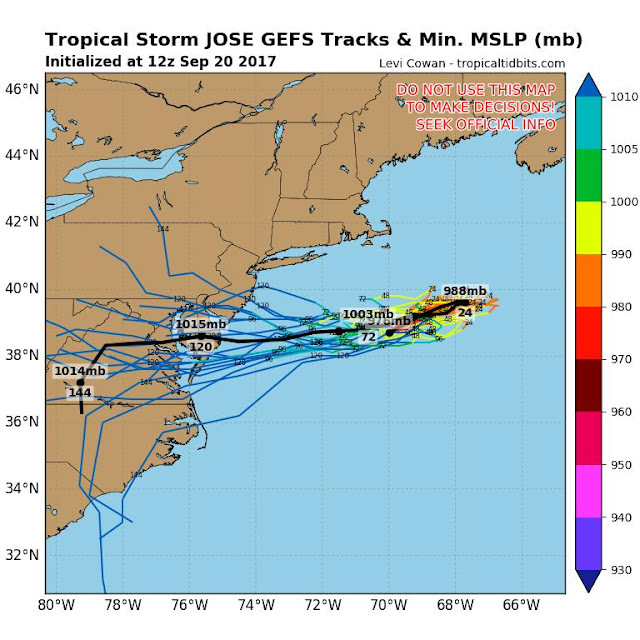 Jose wandered farther east which made all the difference in the impacted forecast for the New Jersey shore. 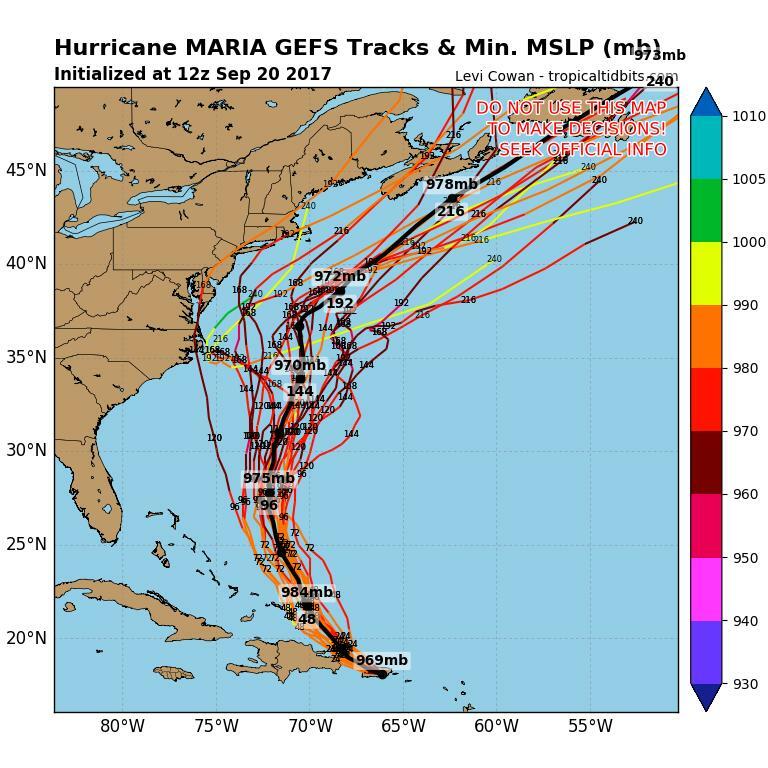 What you see in this summary is the 5:00 pm status of the predictions for Jose, not the much worse tracks of this morning. Perhaps we could have gone but then we may have been stuck in Atlantic City for several days, who knows? Where or where is Maria going?? Curving out to sea, we hope. Lee appears not to be a threat. 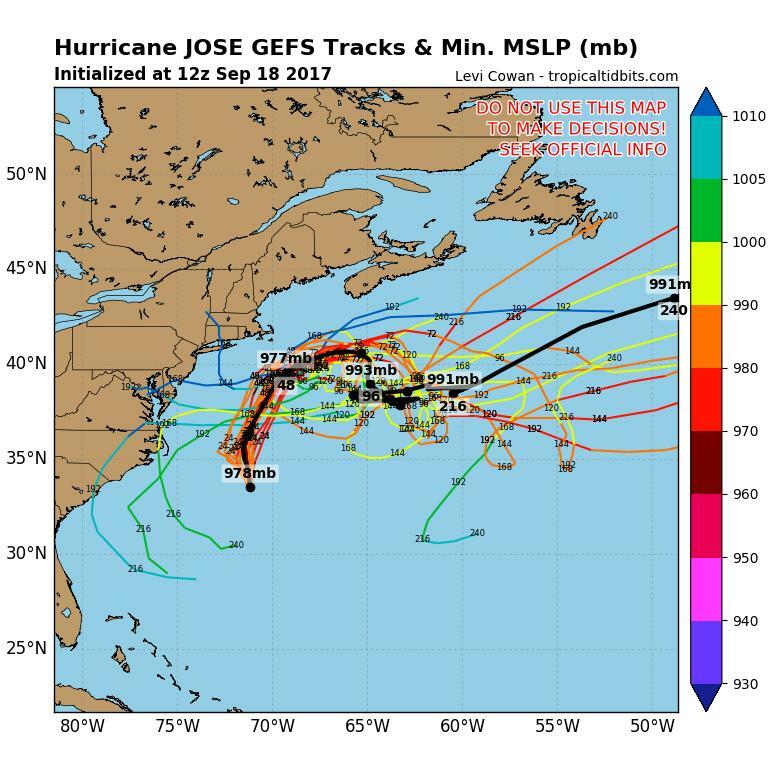 So now we're in a waiting period again and our next checkpoint is after Jose leaves the area; sometime around Saturday, we hope. Nothing is certain anymore and nothing is like the previous years that from our present perspective seem to be child's play although at the time we were on pins and needles. 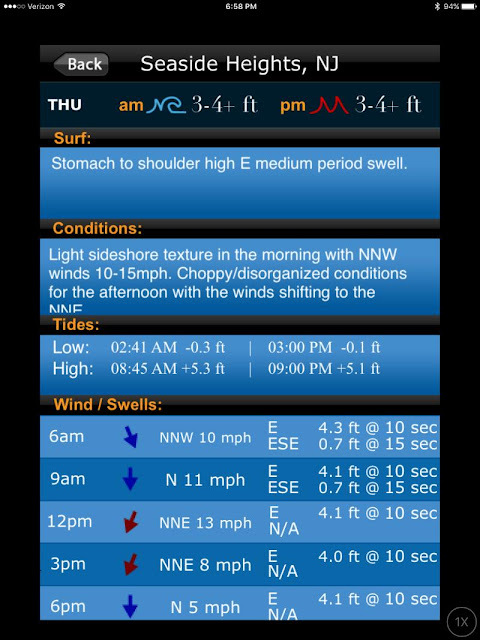 The Wind on the left, waves on the right - this is a much better forecast than this morning's. Too late now. Of course, there's Maria waiting in the wings for her try at disrupting our plans. The models either have her going out to sea (Euro) or impacting North Carolina out banks (US). Anyone for flipping a coin? 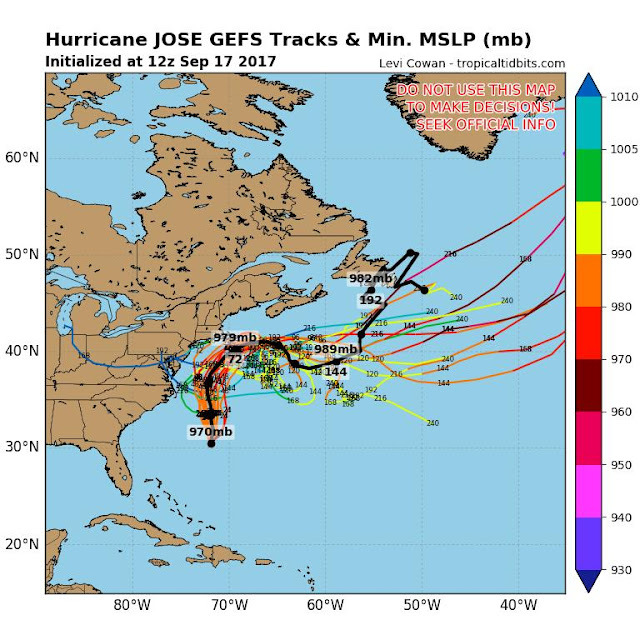 Don't forget the Coastal Forecast from NOAA, much better with a forecast of Jose going farther which only came in this afternoon. Irma drifted a little westward today but the forecast is still a go for us down the coast on 9/21 to Atlantic City. 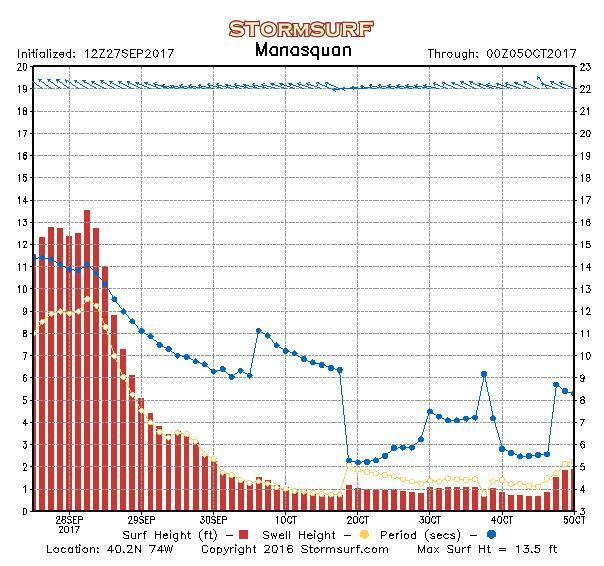 If the forecast holds, we'll leave PYC 9/19 to stage us for the jump down the coast on 9/21 from Atlantic Highlands. Nothing is certain here but so far, so good (or rather, good enough). 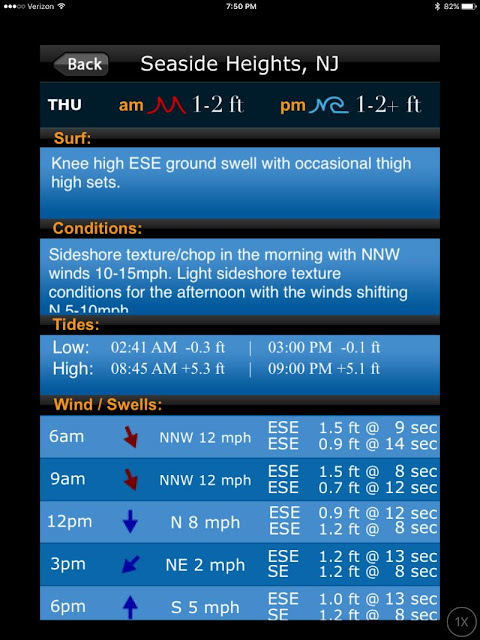 As long as the winds are behind us and the swells have 10 sec periods or so, I'm fine for the trip. Swells with 8 to 12 sec periods are fine, wind-driven waves are not. Hopefully, everything holds true for the next few days. 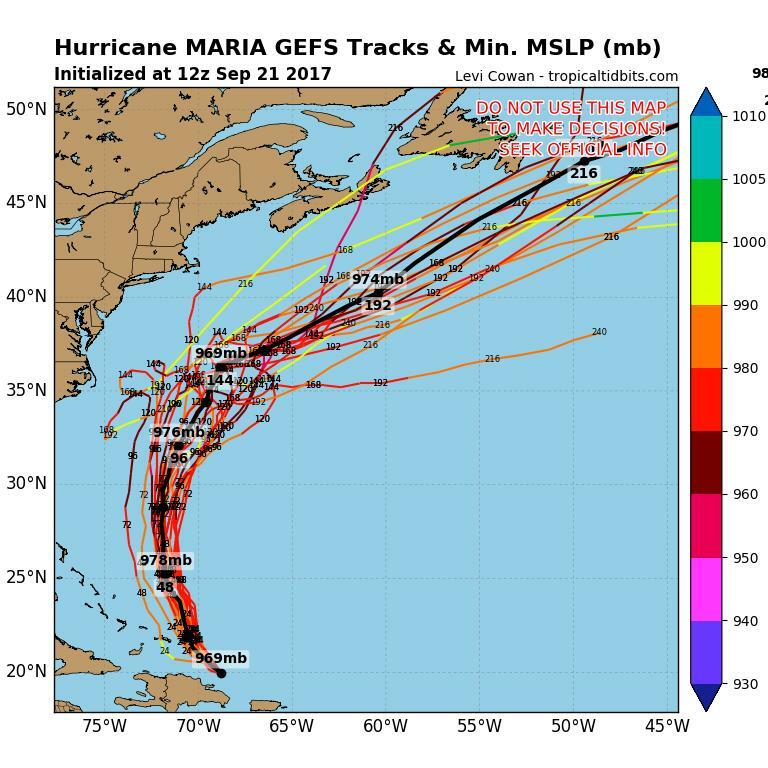 Maria will be a problem. We'll watch. Finally, the NOAA coastal forecast is in line with the others although it covers farther out, to 20 Nm.